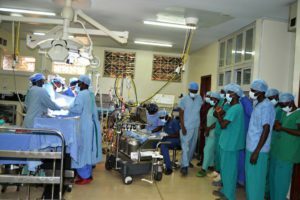 The Uganda Heart Institute has appealed to government for more funding to enable it conduct more highly specialised open-heart surgeries. The institute’s executive director, Dr John Omangino, said at the moment, they receive about Shs11b annually from government, yet they would require about Shs25b to finance their annual operations. The institute caused excitement last month when it conducted the unique coronary artery bypass grafting (CABG), a unique procedure where veins and arteries are picked from other parts of the body and used to repair blood vessels around the heart muscles. But Dr Omangino said whereas they have five patients waiting for specialized surgery, they don’t have the capacity to conduct them for free because they lack funds to procure the required sundries. He added that while they have the specialists conduct the surgeries, patients needing operations may have pay Shs18.2m each, which is used to procure sundries used during surgery since government pays the specialists. On Friday, the Minister of Health, Dr Jane Ruth Aceng, said the Uganda Heart Institute has gained the technical capacity to offer complete range of cardiac care services at a cheaper price comparable to any centre in the world. “The unit cost for comprehensive care, including diagnostic interventions, operating theatre and subsequent care unit in intensive care will only cost 5,000 to 8,000 US dollars (about 30 million shillings) and this cost is very low compared to the 20,000 and 30,000 us dollars (about Shs110 million) charged abroad,” Dr Aceng boasted. According to the officials from the Uganda Heart Institute, they are looking forward to operating about 650 patients.